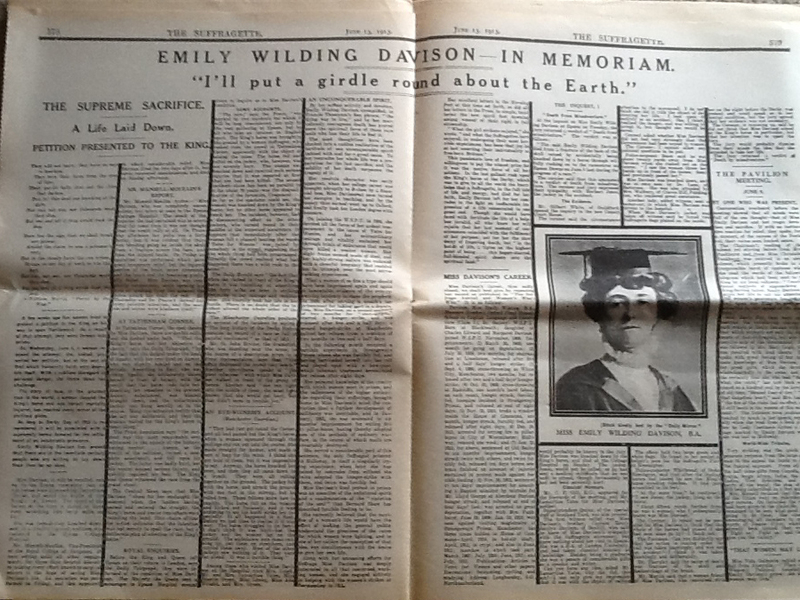 In following guest blog post, women’s suffrage expert Eileen Luscombe looks at the WSPU‘s promotion of Emily Davison as a martyr to the Cause. 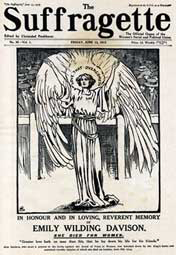 In commemorating Emily’s, tragic and untimely death it is also timely to remember the somewhat exploitative nature of the subsequent Eulogizing employed by the WSPU. In The Suffragette June 13, 1913 Christabel Pankhurst remarked that, “It is a very hard thing to die. Life is dear. But the rarest of all rare things it is for a human being to lay down his life without any prompting of anguish personally felt or witnessed. It is only men and women of superhuman generosity and courage who can die for those unseen, unheard, unknown. This is what Emily Wilding Davison has done. Waiting there in the sun in that gay scene, amongst that heedless crowd, she had in her soul; that vision kept before her. Thus inspired, she threw herself in the fierce current of the race”. © Eileen Luscombe; Please do not reproduce this image without permission. So greatly did she care for freedom that she died for it. So dearly did she love women that she offered her life as their ransom. #Emilymatters highlights gender equality issues & supports campaigns that seek to redress the balance and was created as part of the social media campaign to promote ‘To Freedom’s Cause’ the campaign for equality – still worth fighting for? event at the House of Commons in February 2014. There are some exciting developments in the pipeline, with regards to ‘To Freedom’s Cause’ and #Emilymatters, so please do keep in touch. You can get a weekly summary of worldwide gender equality issues with the To Freedom’s Cause & Other #Emilymatters paper.li newsletter as well as updates on the play and future Kate Willoughby Productions & #Emilymatters projects.